Sunny, The League and Totally Biased are on a new channel—find it. On Monday, Sept. 2, FX launches spin-off network FXX. If that’s not confusing enough—most viewers aren’t going to notice that extra “X,” no matter how many promos you beat over their heads—the new net is taking three of FX’s biggest players in the switch (well, two and a late-night talk show seen by more critics than real people). It’s not all bad news: During the shuffle, the Fox Soccer channel will cease to exist, with most of that network’s white-knuckle coverage of leisurely jogs and 0-0 ties being parsed out to Fox Sports 1 (the former Speed channel) and Fox Sports 2 (ex-Fuel TV). The Fox News Channel will still retain the “News” in its title, as an FCC ruling on using the ironic quotes is currently in deadlock. Despite the hassle of looking up a new channel (first-world problems, people), FXX is kicking off in the smartest fashion possible: with a 34-hour Parks & Recreation marathon on Labor Day, Monday, Sept. 2. Besides the syndicated premiere of Parks & Rec, FXX will also be carrying reruns of How I Met Your Mother, Rescue Me, Arrested Development and Freaks & Geeks. I’d be fine with a round-the-clock Parks & Recreation-only schedule, but that’s probably just me. In the Season 9(!) premiere of the criminally Emmy-less It’s Always Sunny in Philadelphia on Sept. 4, Sweet Dee (Kaitlin Olson), after years of merciless attacks on her self-esteem from the rest of the Gang, finally embraces her self-loathing—which, naturally, leads to overnight stand-up comedy success (ask any comedian; this is the first, and really only, step). Next week, Frank (Danny DeVito) makes a perfectly reasonable case for gun ownership—or at least as reasonable as that of your uncle who’s fortifying his bunker against Obama’s mind-control drones and swears by the Fox “News” Channel (the FCC ruling just came down). When we last saw The League, female-repellant Andre (Paul Scheer) was engaged—to someone named Trixie (Glee’s Jayma Mays), no less. In the Season 5 premiere, as the fantasy-football buds travel to Los Angeles for the couple’s “destination wedding” (aaand let the mocking commence). Just as It’s Always Sunny isn’t really about some idiots running a bar—but seriously, how is that dump Paddy’s still even in business?—The League is less about sports stats than it is about five dudes and one dude-like lady who will stop at nothing to bust each other’s balls/ovaries—and it’s never not funny (except when real-life athletes drop in and try to “act”). It hasn’t been stated outright in any of the advance PR, but it’s obvious that FXX is a more comedic answer to FX; none of the dramas are changing channels, and the acquired TV series and movies lean funny—kind of like how TNT is more drama-driven than sister network TBS, or C-SPAN is an outright laugh-riot compared to C-SPAN 2. 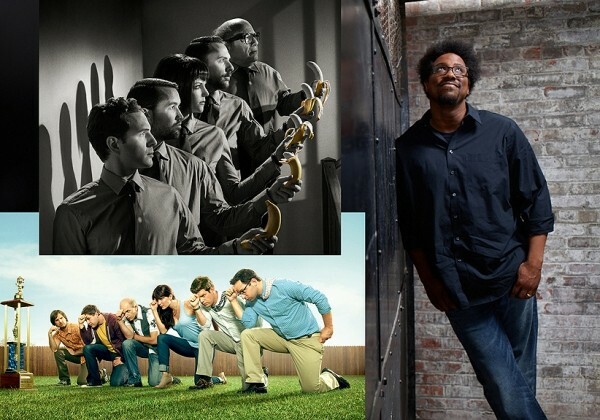 Or how Totally Biased With W. Kamau Bell looked like genius alongside the recently canceled Brand X With Russell Brand. Surprise: It’s still genius, and now he’ll be on Monday through Thursday. It’s good to have at least one late-night talk show not hosted by a white guy in a suit, ’Merica.